The L.U.C Full Strike launched at the end of 2016 was the highlight of the Chopard Manufacture 20th anniversary celebrations. It was the Maison’s first minute repeater watch and featured several world firsts. It strikes the hours, quarters and minutes on sapphire gongs. Its extremely original construction, the excellence of its Poinçon de Genève certified finishing, and above all its extraordinary sound quality, make it a watch that stands out from the rest, in a league of its own. Aesthetically refined and pleasing to wear, it houses the very best of the expertise, inventiveness and quality characterising the L.U.C collection. The L.U.C Full Strike has a unique sound signature, beautifully resonant and crystal-clear. The gongs are tuned to two notes: C and F. The richness of tone is unprecedented, since this is the first time that sapphire has been used as an acoustic generator and amplifier. Behind this acoustic result lies one of the most sophisticated and inventive movements ever created by Chopard Manufacture. Almost 17,000 hours of development have been lavished on the development of calibre 08.01-L, which is subjected to three pending patents. Chopard has found all-new in-house responses to historical issues relating to the nature of the gongs, as well as to the operation and ergonomics of the striking system as a whole. In particular, this movement comprises a series of security systems that protect it from all the inappropriate handling operations that can damage minute repeaters. Its crown serves to wind the movement in one direction, and its striking mechanism in the other. The L.U.C Full Strike thus accumulates enough energy to strike 12:59 – the longest time in the minute repeater repertoire – 12 times. It is equipped with a double power-reserve indicator positioned at 2 o’clock and featuring two superimposed hands respectively indicating the striking-mechanism reserve and the movement’s autonomy. The true strength of the L.U.C Full Strike resides in the fact that this impressive array of technical prowess goes discreetly unnoticed on the wrist, thanks to a thoroughly refined watch bearing the Poinçon de Genève quality hallmark. Pressing the crown-integrated pusher causes it to chime the hours, quarters and minutes, to the delight of its owner and those around him. Transparent sapphire crystal is the material traditionally used for scratch-resistant watch glasses. This very hard and homogenous material also boasts amazing acoustical properties that Chopard has succeeded in leveraging: typical minute repeater gongs are made of steel or gold segments which vibrate when struck, producing their characteristic sound. The L.U.C Full Strike is unique in that it is equipped with sapphire gongs. Moreover, Chopard has opted to step things up a notch, since these gongs form part of a coherent set. The gongs and watch glass are in fact machined together from a single sapphire block. They thus form a single welding-, glue- and screw-free entity: a construction that is totally unique in watchmaking history and for which a patent has been filed. In the watch industry, just as in the hi-fi field, breaks in material are detrimental to the transmission of acoustic waves. The perfect physical integrity between the gongs and the watch glass transmits the sound directly outside the watch, with all its strength and its singular personality. Another proof of sapphire’s versatility is its perfect robustness. Even after tests in which it undergoes one and half million impacts with steel hammers, it does not break. The corollary of this hardness is the extreme difficulty involved in working with it. Machining such a tiny set of parts in such a resistant material, without breaking the connection between the gongs and the watch glass, called for tools that are both powerful and accurate. Machining the gongs/glass set alone required more than three years of development, representing a major technical and human feat. Alongside its inherent horological richness, the L.U.C Full Strike is a supremely elegant watch. In keeping with the L.U.C watch design codes, it features a vertical satin-brushed caseband creating a striking contrast with the polished bezel and case-back. 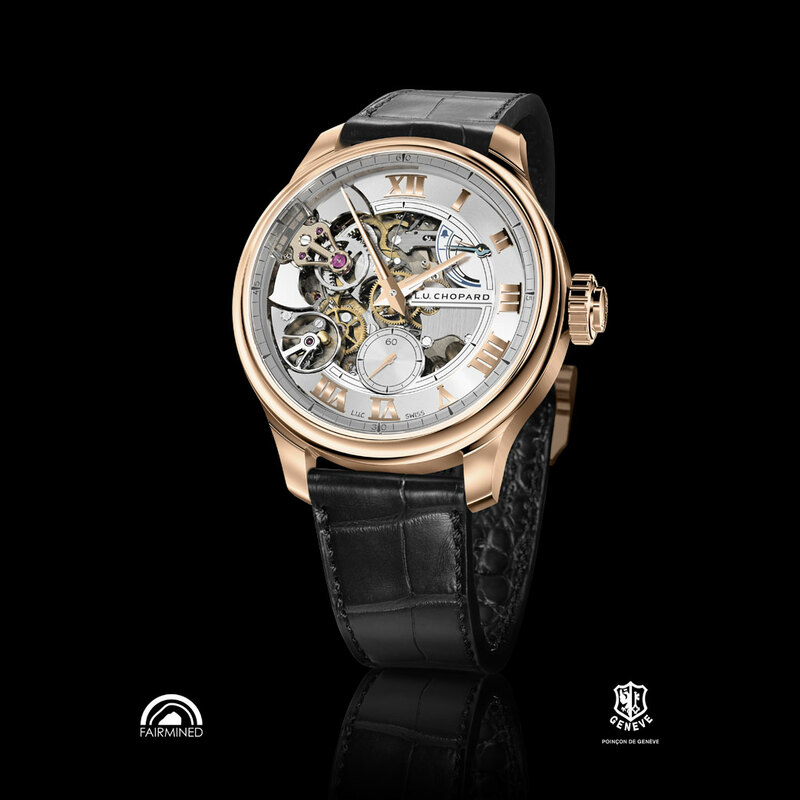 All the inscriptions on the latter are hand-engraved and the case is made from 18-carat Fairmined rose gold. This label guarantees that Chopard has sourced this gold from a cooperative whose operations are certified as ethical, fair and sustainable. Measuring 42.5 mm in diameter and 11.5 mm thick, this reasonably sized case is graced with beautifully balanced lines. Minute repeaters are generally fitted with a winding lever that supplies the necessary energy to the striking mechanism. The minute repeater of the L.U.C Full Strike is triggered by pressing a pusher coaxial with the crown. The watch is fitted with a double-sided, hand-sewn and plant-dyed CITES-certified alligator leather strap. This means that whether one is admiring the watch from the dial or the movement side, it always appears attired in the same precious leather. Calibre 08.01-L is based on an exceptional construction. A traditional minute repeater is all about levels, with one layer measuring the time and another transforming this time into notes. The extremely thin new L.U.C calibre enables the L.U.C Full Strike to measures just 11.5 mm thick in all, a modest figure for a watch with an over 500-part movement. On one side of the calibre, the barrel, going train and regulating organ form a timekeeping ensemble with a 60-hour power reserve certified by the Swiss Official Chronometer Testing Institute (COSC). In this respect, the L.U.C Full Strike meets the demands imposed by Karl-Friedrich Scheufele, co-president of Chopard, who wanted the L.U.C collection to comprise Haute Horlogerie watches with certified precision. Contrary to tradition, the minute repeater mechanism is placed on the dial side and is thus entirely visible. The L.U.C Full Strike steel hammers feature an individually modifiable striking force, thus making it possible for the watchmaker to perform fine adjustment of the acoustic intensity. A minute repeater mechanism is a system of interactions that is unparalleled in watchmaking. Numerous movement parts are in motion and this implies equally numerous risks of breakage. Chopard has therefore equipped Calibre 08.01-L with three security devices protecting it from any handling mistakes. The striking mechanism power reserve is coupled with a semi-toothed wheel. When the reserve drops too low, it deactivates the minute repeater chime, thus ensuring that the watch cannot sound fully, due to the lack of energy. Moreover, in order to maximise the striking mechanism power reserve, an ingenious patented device has been incorporated into the coupling-clutch of Calibre 08.01-L. During coupling and uncoupling, the regulator does not rotate, and only when everything is in its appointed place does the striking mechanism actually consume energy. During the chime itself, the crown is disconnected from the movement, thereby making it impossible to perform any time-setting that could damage the movement. The activating pusher built into the crown is also deactivated at this time, since a second attempt to trigger the mechanism might otherwise force the striking mechanism coupling-clutch. This close attention devoted to details applies to the entire L.U.C Full Strike, since both its movement and case bear the Poinçon de Genève quality hallmark. This particularly demanding certification implies technical and aesthetic choices that further increase the complexity of the construction and production of the components making up Calibre 08.01-L. For example, it stipulates that springs must not be wires and must have a heel, as well as being decorated. This must be achieved even on those holding the regulator inertia-blocks and measuring just 7/100ths of a millimetre thick. All the components of Calibre 08.01-L are meticulously finished, be it with circular graining, straight graining or a Côtes de Genève motif. They are all meticulously hand-chamfered. The mainplate and bridges are made from nickel silver, a noble metal that can tolerate no scratches or workmanship errors. This material is non-treated and appears in all its natural subtly golden grey beauty through the the sapphire case-back of the L.U.C Full Strike. By combining beautiful details and extremely meticulous finishing with a full-bodied, crystal-clear sound, the L.U.C Full Strike single-handedly embodies the full scope of Chopard’s watchmaking competencies. Twenty years after the creation of Chopard Manufacture, it offers an outstanding interpretation of the minute repeater watch that is ideally suited to daily wear and only reveals the full extent of its refinement to an attentive and expert ear – that of a modern gentleman with a penchant for exceptional objects.